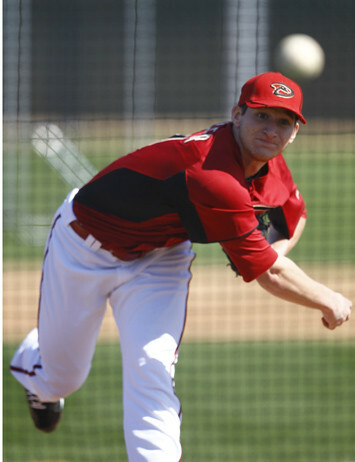 If you’ve been yearning to get a look at D-backs pitching prospect Jarrod Parker in action, today is your day. The young righty will pitch against the Colorado Rockies. Obviously, pitchers aren’t firing with 100 percent of their velocity this early in the spring, but you’ll be able to watch Parker in his first professional game since July 2009, at least his first outside of instructional league. It will also be our first glimpse of Barry Enright so far this spring. After a terrific big league debut in 2010, he’s fighting for a rotation spot alongside veterans Zach Duke, Aaron Heilman and Armando Galarraga. Coincidentally, Monday is our first look at Galarraga in a D-backs uniform as well. Follow me on Twitter (Insider_Writer) for in-game updates.